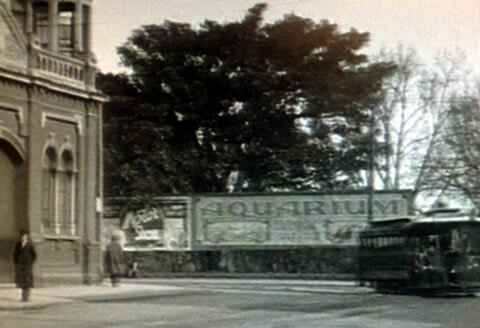 We were surprised to see on a DVD about old trams, an advertising hoarding in Carlton for a Melbourne Aquarium except it was the 1930's. As the cable tram rounded the corner from Nicholson Street into Gertrude Street, the sign is seen in the gardens of the Royal Exhibition Building. The other sign appears to be advertising the Motor Show, probably on at the Royal Exhibition Building. A little bit of research (that did not disclose much) but we did find.. The wing of the building which once housed Melbourne's aquarium burnt down in 1953. This was found on the Wikipedia web site for Royal Exhibition Building. Clearly, not the Melbourne Aquarium that opened in the city in 1999.